Simply Refreshing Weddings. 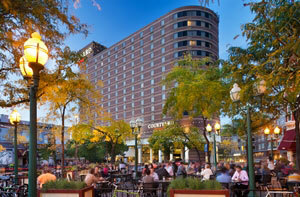 Courtyard by Marriott Minneapolis Downtown is the perfect place to host your special day. Our staff is dedicated to providing attentive and personalized service just as distinctive as your celebration. Do you have space for doing a ceremony? We offer breathtaking views of the Mississippi River and Stone Arch Bridge. After recently completing a $17 million renovation we offer an upscale experience at an affordable price.